Do you want your course or event, job vacancy, product or services reach more professionals with an interest in Audiology? Why not advertise through the BSA? We offer a range of packages both in our membership magazine and online through our website, social media and email adverts. We want to know what kinds of advertising works for you and so if you want to discuss any bespoke packages please contact our office at bsa@thebsa.org.uk who can discuss your needs and send you a full list of our advertising rates. The website has on average 3,600 users each month and 14,500 unique page views. We collate statistics on the website on a quarterly basis which we can share with you. We send an e-newsletter (called the BSA’s e-update) out to all of our members on the 15th of each month to 1,300 contacts. The newsletter has an open rate of 35% in the first 6 months of running this. We can provide further statistics to you if required. We currently concentrate on a Facebook page which has 900 likes and our twitter account has 1,700 follows. We are happy to discuss advertising your campaign through our social media channels and highlighting your own social media campaigns through our own feed. 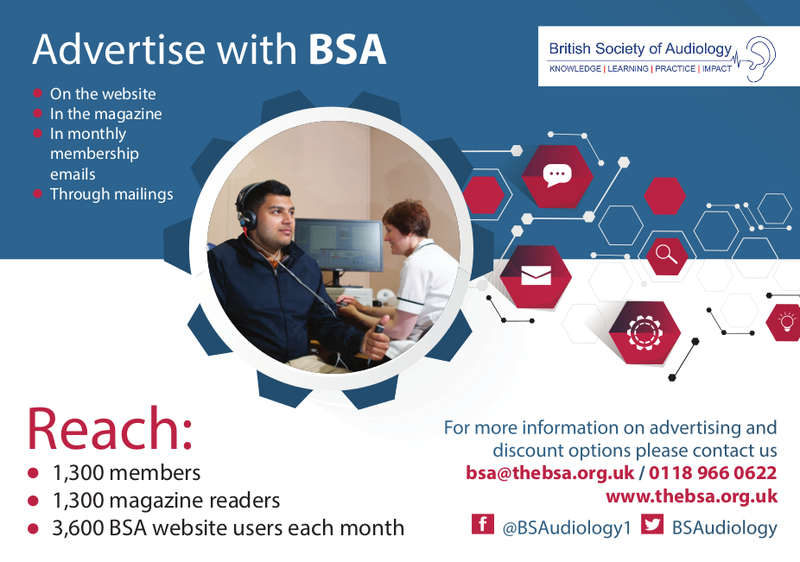 Audacity is the membership publication of the British Society of Audiology. Within its pages, the editorial team aims to promote learning and knowledge that reflects the clinical, academic and research interests of our multidisciplinary membership. There are 2 editions per year (spring and autumn) available in printed copies and electronic pdfs. The publication dates of Audacity are changing to February and August each year. The advertising deadlines will therefore be 30th December and 30th June each year. We are always keen to know more about your experience and how effective your advertising was with us, so please stay in contact after the campaign has finished and let us know how you got on.